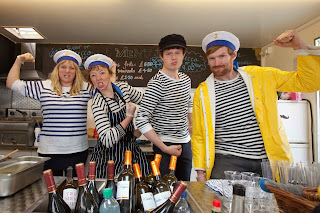 The Mussel Men have moved on from their weekend pop-up at Brew 4 Two in Hackney, and have now announced that they will be taking over the site at 428 Kingsland Road from The Dead Dolls Club, from 27th November (when there will be a big party) for their mussels, frites, prosecco, thumb wars and more. "Good day fine lovers of seafood…and/or thumb wars, we have GREAT news! From the 27th November we’re being passed the baton by our fab friends The Dead Dolls Club and are taking over the residency of their amazing space on Kingsland Road, Dalston. Open 6 days a week, we’ll be maintaining their fantastic vibe of great food, crazy cocktails and some late night boogying! While adding our own sailor spin on things with new and exciting offerings such as a SEAFOOD FEASTING SUNDAY ROAST and obviously several thumb wars to the death! We’re having a right royal knees up on the 27th November with a sea shanty band starting the night as we mean to go on. We’re inviting all our loyal sea maidens and courageous captains to board the ship and come and help us christen our new fine lady of the Dalston high seas!!!"